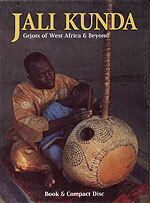 CD review: "Jali Kunda: Griots of West Africa & Beyond"
Of all Ellipsis Arts' many box sets from around the world, "Jali Kunda" is easily the most beautiful. The 96-page booklet is, quite simply, stunning  with heavy glossy pages adorned with startling full-color photographs of the musicians featured on the accompanying CD. And the excellence of "Jali Kunda" goes beyond the cosmetic (although what cosmetics!). There are some outstanding essays in the booklet, many from West African musicians explaining their art. And, of course, there is the music on the CD. The only weakness of "Jali Kunda"  although it's a biggie  is Robert Palmer's self-serving and highly politicized introduction to the griot tradition in the book. The emotional need of some American critics (although Palmer is also a highly talented producer of blues albums) to tie American blues and jazz to contemporary African forms often takes on a religious fervor that gets in the way of good history, sociology or ethnomusicology. And a later essay on American jazz artist Pharoah Sanders and his interest in African music likewise falls into political correct gibberish that offers no real knowledge to the reader. Fortunately, there is the music to fall back on, music so outstanding that it can't be diminished by all the psychobabble and nonsensical pseudo-academic ruminations in the book; music that grabs your mind, heart and soul with its beauty and intensity. The music here is built around call-and-response vocals and the shimmering sound of the kora, a lutelike instrument with a huge gourd for a resonating body and about a dozen strings running up a skinny neck. The combination is mesmerizing, and more than worthy of the attention heaped upon it in the book and glossy packaging.